Patrick, could you give us some more details about your test system? Did you install the Simplified Chinese language packs while performing the installation? If so, what's the version of e.g. 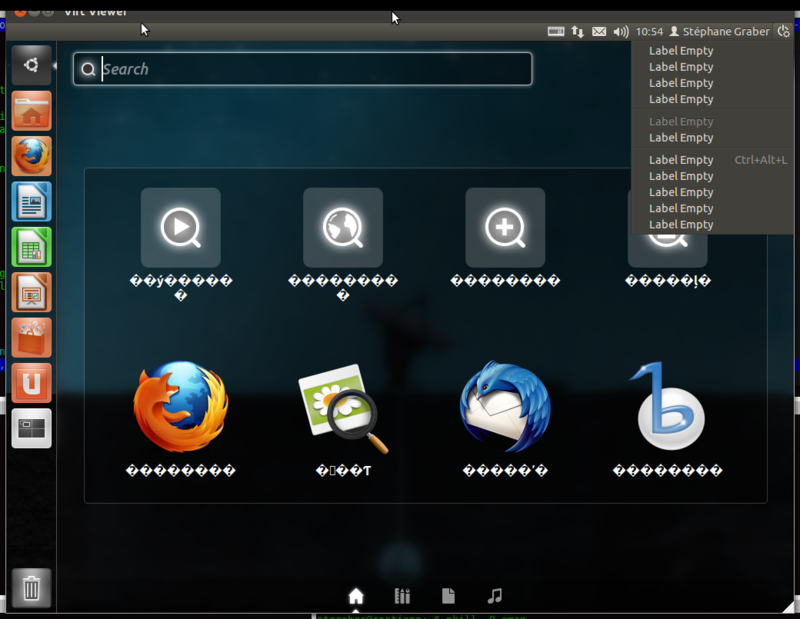 language-pack-gnome-base? Also, what does "Mute and Preferences are labeled as Label Empty" mean? Sorry, I meant 'language-pack-gnome-zh-hans-base' in my previous comment. 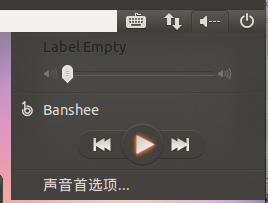 I am seeing the "Label Empty" string for Mute, but not for "Preferences..", which does display in Chinese/Simplified. It occurs for me only during oem-config (this image does not use ubiquity-frontend, it uses oem-config). (In order to even get the indictor applets to be IN zh_CN, I had to modify /etc/init/oem-config.conf to export LANG and LANGUAGE - see bug 812988). Later, after oem-config has completed and user has logged in, the sound indicator is completely translated. I wonder therefore whether this is some kind of software bug along the lines of the label *widget* existing but with null label text, and so something in the toolkit causes it to display "Label Empty". Note that in this particular case, there is no sound: that is, the icon shows the speaker followed by "--", meaning "no sound", I presume. and is apparently a marker that a program using libdbusmenu failed to set the "label" property. I cannot reproduce this problem on the current beta-1 images. I tried with Ubuntu 3D on real iron (Dell Mini 10), with a freshly created user with zh_CN and all language packs, and with Ubuntu 2D in the live session of the Chinese Edition in kvm. In both cases all the indicators have proper Chinese labels, i. e. sound (this bug), date/time (bug 771522), and messages (bug 771528). Do you have a recipe for reproducing this in kvm? Which image type did you select? Does it happen in a live system, or only on installation? Ted, are there known race conditions with setting the label property? I get all indicators in Chinese, except for a few untranslated strings like "User accounts..." and "Switch User...", but none of them are "Label Empty". What is your locale combination, i. e. what does "locale" show? I can reproduce on a simplified chinese installation using Oneiric Desktop i386 20110901 on VirtualBox. LANGUAGE is set to "zh_CN:"
everything else is set to "zh_CN"
> I can reproduce on a simplified chinese installation using Oneiric Desktop i386 20110901 on VirtualBox. > LANGUAGE is set to "zh_CN:"
> everything else is set to "zh_CN"
I'll try another install with this. 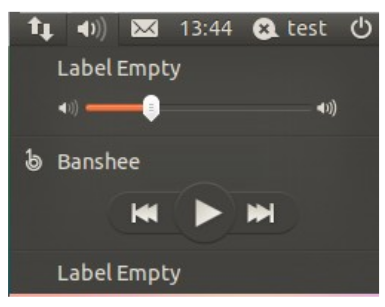 + sound indicator shows "Empty Lable"
summary: - sound indicator shows "Empty Lable"
+ sound indicator shows "Empty Label"
summary: - sound indicator shows "Empty Label"
+ sound indicator shows "Label Empty"
Fixing it manually and reopening the session fixes everything. Confirmed. Also, LANGUAGE should be "zh_CN:en", but that's a minor problem. $LANG must be a correct locale, i. e. "zh_CN.UTF-8". What happened here is that gettext uses Chinese, but determines LC_CTYPE as "C", because "zh_CN" is invalid. So a lot of programs have trouble displaying non-ASCII characters properly. summary: - sound indicator shows "Label Empty"
- another choosing zh_CN in gfxboot and then keeping zh_CN in the installer, result was zh_CN.UTF-8 as well. This seems to confirm that Chinese installs now work properly though I'm unable to find what changed since Thursday. I'm going to run one more test using today's Edubuntu 64bit image as it was the image I used to reproduce the bug on Thursday. If I can't reproduce it this way either, I'll mark the bug as fix released. Still unable to reproduce it with Edubuntu. Marking as Fix released.